It's official. I am going to be teaching people how to make their own mandalas. Next week, I will be doing a series of three workshops entitled "Mandala: An Artful Meditation" at Jim Donovan's Summer Rhythm Renewal retreat in Loretto, PA. 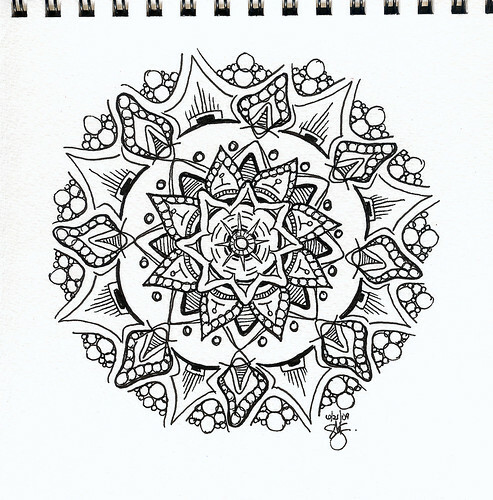 I am very excited to be doing this because I believe the mandala is a form of spiritual expression that anyone can do, even if they have no prior art experience. It's about releasing self judgments and simply allowing yourself to make marks on paper. By injecting intention into the process, it can be used as a form of artful affirmation. Once completed, it can be used for reflection, or it can be destroyed as a form of letting go. The video below shows some of the over 500 mandalas I have created in the last couple of years. It's set to music from the CD "Pulse" by Jim Donovan. Congratulations ! Well done ! Good luck. I'm sure it'll be a fun experience. Very cool. Wish it was someplace where I could attend. The aimlessness of drawing mandalas always made me uncomfortable, but watching your video left me wanting to start drawing. I bet you can recall the mood in which you created every single mandala just by looking at it, they are so full of emotion, energy and personality. awesome! can't wait to hear more about how it all unfolds for you. i've been enjoying your blog so much. really appreciate the product reviews! Antigone - I really appreciate your comments. While I can understand what you mean about aimless drawing, injecting intention into the process or feeding off of emotion makes it all worthwhile. Stacy - thank you for reading my blog! And I will surely be blogging about the experience once it's over. Best of luck! I'm you all will have a great time on scuh creative endeavour! Ever try painting with your fountain pen inks?